Sometimes this bike blog feels like a weather blog, but that’s because this winter’s weather has made biking all about just getting through it. After our lovely spring days earlier in the week, Thursday woke up to howling winds and sub-freezing temps, but hey, I’ve got to get to work, and I’m a stubborn thing, so I layered up, unfolded Brompty, and headed down the hill to the train station. Other than a few heavy gusts that made my eyes start gushing wintertears, it wasn’t really that bad. And then I got out on the other side, at Halethorpe. The wind was wild, and I had to pump those pedals as hard as I could in their granniest gear just to stay upright–even going downhill. I gave up on the last hill and did something I haven’t done in a very, very long time–so long I can’t remember the last time I did this: I got off my bike and walked. Oh, the shame! I got back on at the top of the hill and rode around to my building’s transparent double front doors, and inside a couple of guys were chatting in the hallway. They saw me ride up and hit the button for me to open the doors. “Well, that was unpleasant,” I said. They laughed, I went to a meeting, I went to class, and then classes were cancelled and school was closed due to a water main break. Time to head back out in the winds, it felt totally worth it because FREE SURPRISE NOT-SNOW SNOW DAY! 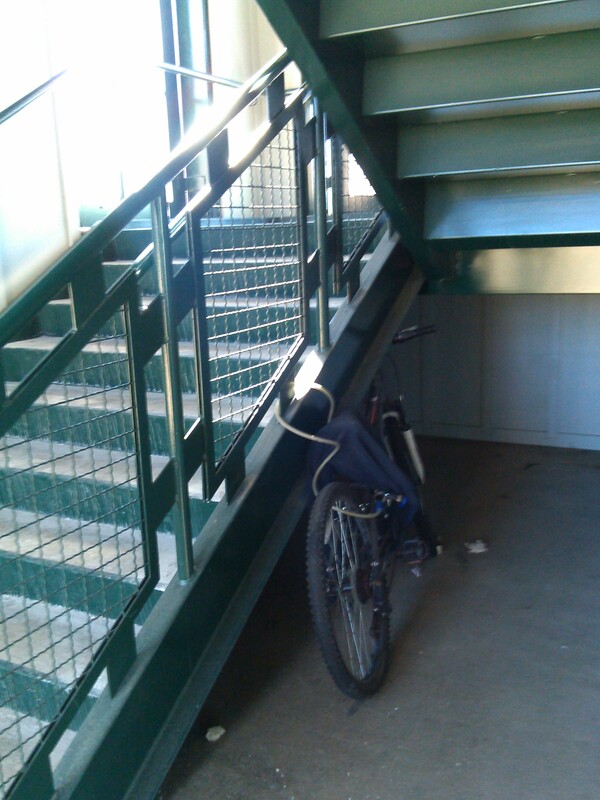 I got the station 15 minutes early and spent some time with this bike that’s always locked under the stairs here. I’m not sure who rides it, but Thursday would be a good day to take the bus instead. If I had a car, I would have driven. The great thing about not having a car anymore is that I got a bike ride in on this day, in spite of the inhospitable conditions, and as it turns out, it is still the greatest commute in the world compared to sitting in a tin can all by myself, no matter the weather. This entry was posted in commuting, weather and tagged Baltimore, cold weather, commuting, Halethorpe, wind. Bookmark the permalink. Funny, but in the “early” years, I didn’t have a working car and had to ride my bike to work, school and home. I was always hesitant to let folks know how much I actually liked it – they were effusive in their praise for my toughness, (there is Winter in Idaho, after all) and I have always liked praise. Glad to know you have found the elusive pleasure in temporary physical discomfort. You are in rare company.